This quirky San Diego library is named after one of the city’s most famous residents—Theodor Seuss Geisel, aka Dr. Seuss. This impressive brick structure houses maps, photographs, books and manuscripts—some dating all the way back to the 15th century. This building made from natural materials is perfectly located for getting stuck inside a good fairy-tale—beautiful woods surround the entire library. The marble, the high ceilings, the lions guarding the outside—the main branch of the city’s libraries is a must-see for any visitor to the Big Apple. Recognize the red brick interior? 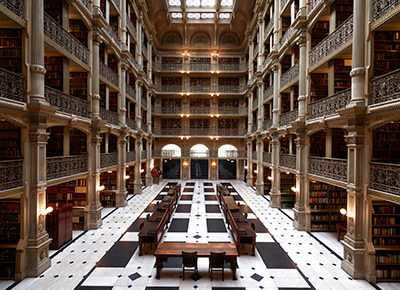 The library was featured in the 1993 Oscar-winning movie Philadelphia. This city landmark’s unique design includes 11 stories of glass and steel and a “book spiral”—four floors of book stacks connected by ramps so that visitors can browse the library’s collection without using the stairs.